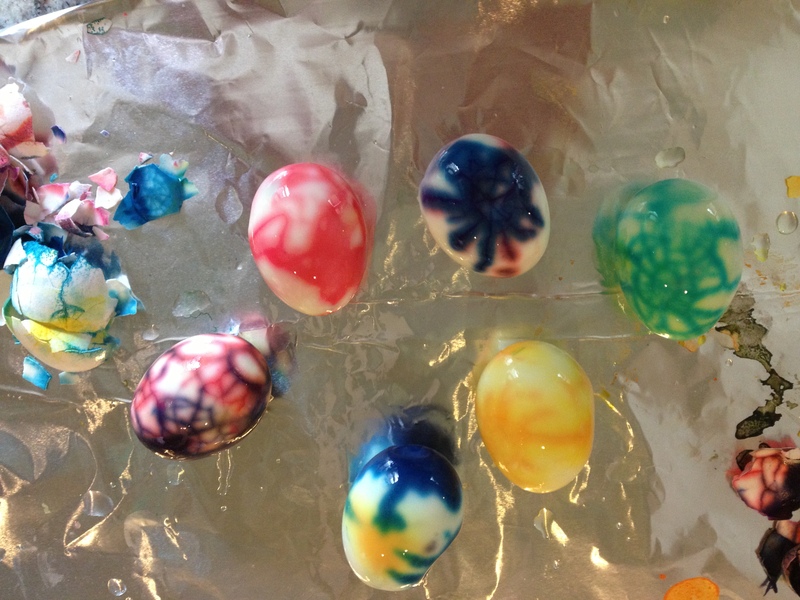 Yesterday we tried the extra cool Easter eggs we found on Pinterest here. We only had the pictures for directions so here’s how we did it. 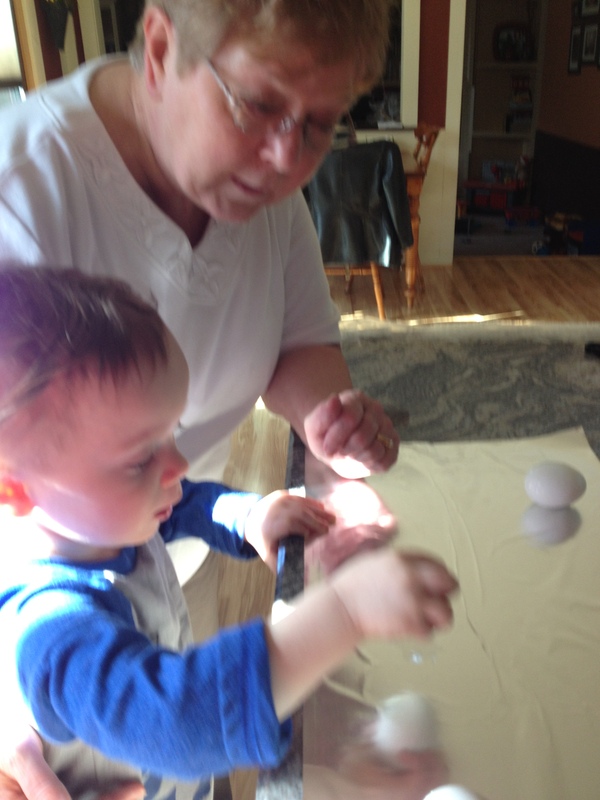 Gage helped Grandma crack the hardboiled eggs. We added food coloring into the cracks and let them dry in the frig overnight. Unabridged audio 7 hours, 35 minutes. Read by Karen White who did an excellent job. When I read Allen’s first novel, Garden Spells, I fell in love with this writer who embodies lightness and magical realism in such a beautiful way. I love the southern charm and those moments of the supernatural in her books. I always finish satisfied. Once I got past that expectation I enjoyed the book for what it was, a great story of friendship among women, from one generation to the next. Some of the whimsy was missing, but only missing because I expected it. Wall of Water, North Carolina, is home to Willa, Paxton, and Sebastian. Though none of them were friends in high school, Paxton and Sebastian are inseparable now. Willa own her own store and lives a happy but quiet life. When Paxton restores the Blue Ridge Madam, an old home important to Willa’s family, it brings a mystery that leads them both to their grandmothers, looking for answers. I loved the friendship that forms between Willa and Paxton, much like the one their grandmothers shared many years ago. By the end of the book I was ready to look up some of my friends from high school to see if we could be BFFs again. I also loved how the story showed how much where and how we grow up influences who we are as adults, and not just in the obvious ways. I moved away from home when I went to college and, except for a 5 month pit stop after I graduated, I’ve never moved back. So, I understood when Paxton’s brother didn’t want to move back to Wall of Water, afraid he’d forever be labelled ‘Stick Man’. And Paxton, who had never lived anywhere else, lived the opposite life, always struggling with the expectations placed on her. There was was much to like about this story. Jay Erlich’s nephew has been found at the bottom of a cliff at Morrow Bay. It’s all just a tragic suicide, until secrets from the past begin to rear up again. Did a notorious killer, jailed for many decades, have his hand in this? Years ago, Jay Erlich’s older brother, Charlie, a wayward child of the sixties, set out for California, where he fell under the sway of a charismatic but deeply disturbed cultlike figure. Tragedy ensued and lives were destroyed, but as the decades passed, Charlie married and raised a family and lived a quiet, secluded life under the radar. Yet the demons that nearly destroyed him never completely disappeared. When Jay heads out west to help his grieving brother, he is pulled back into Charlie’s past–and begins to suspect that his nephew’s suicide may not have been that at all. With eyes wide open, Jay puts his own life at risk to uncover the truth, a quest that goes beyond the edge of madness and a family haunted by a secret past . . . and into the depths of evil. There was non-stop action and creepy characters, complicated sibling relationships and inequality in the way society deals with mental illness. 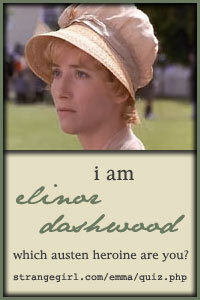 One of the main characters was even suffering with organ transplant issues. I loved the exploration of Jay and Charlie’s relationship. I thought it was spot on. I was heartbroken, along with Charlie and his wife about the way that the cops and hospitals dealt with their troubled son. This was a big storyline in the beginning and I wish Gross had followed up with it. The story itself deals with a crime decades old and it was a little hard for me to get into even though it provided a Charles Manson like villain. 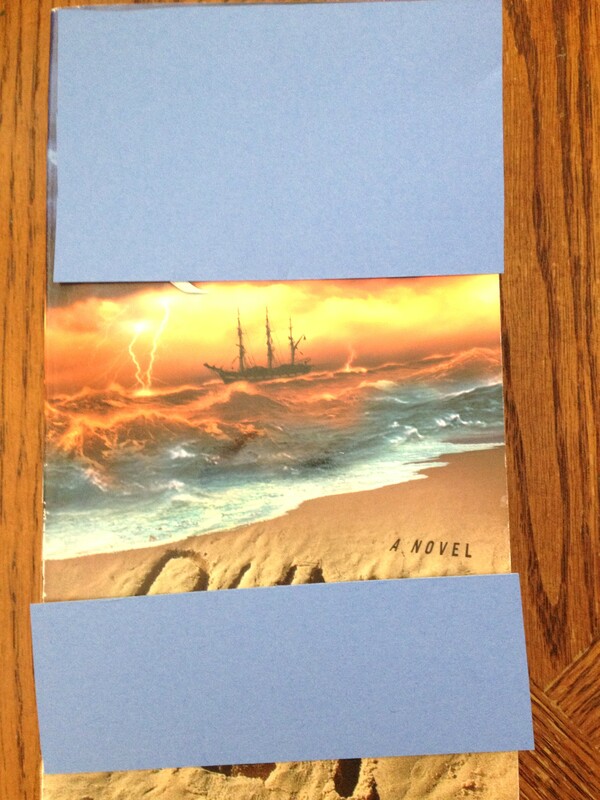 I thought the book was average. It had high points and low points, but it was good enough for me to give this author another try someday. 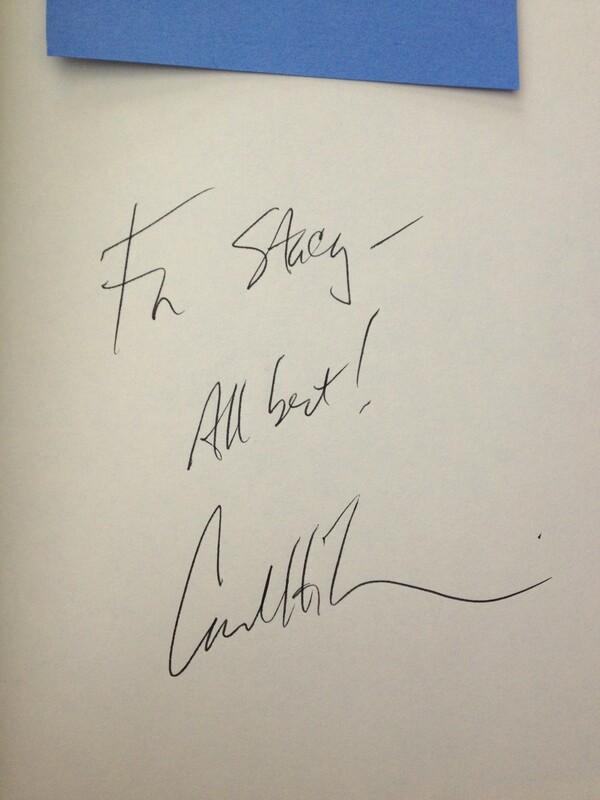 I bought this book for my Nook. I’m guessing I’m not the only one looking out my window at a yard full of snow. In spring. (sigh) It’s Spring Break time around here and most of the kids I know head south and don’t stop till they hit a beach in Florida. So, let’s head to Florida. 1. Before Scout Finch there was Jody Baxter, the ten year-old hero of The Yearling by Marjorie Kinnan Rawlings. Last week’s Tall Guy Quiz here. Leaderboard here. Mary was the It girl in her Rhode Island high school and geeky Ted was lucky enough to catch her eye when he stood up for her mentally disabled brother. They made a date for prom that ended in a hospital stay and then Mary disappeared. It’s 13 years later and he hires Healy to find her for him. Mary is in Florida, but Healy decides to throw Ted off the scent by lying to him and then moving to Florida to pursue her himself. Why I love it- I saw this at the theater when it came out and I was scandalized. This raunchy, perfect-for-teen-boys humor was not my thing at all. I remember feeling embarrassed at some of the crude things I laughed at. It was not in my comfort zone, and yet at its heart it was a love story between two characters that I loved and was rooting for the whole way. It made me laugh and it satisfied my goofy heart. There is something about Ben Stiller that I find charming and usually funny. He has this awkward, neurotic way about him that I always seem to respond to in a positive way. He was perfect in this role. I’m not sure how many actors could have pulled off the iconic zipper scene with such intensity. Even as I was cringing I was laughing out loud. For me, the Farrelly brothers almost always go too far, but in this movie, it is Ben Stiller and the luminous Cameron Diaz that keep the movie centered. The two scenes with the dog, Puffy, being abused by Mary’s boyfriends are so outrageous that they are only funny because Puffy somehow manages to live another day. And I love the reveal at the end. It makes the movie end on a fun note for me. I’ve seen this movie countless times and it always makes me laugh. As of this year this is the 5th highest grossing romantic comedy of all-time and Cameron Diaz was nominated for a Golden Globe for her role as Mary. Irreverent, tasteless, and very funny. The rest of my Top 100 List. I read this because it was on JoAnn’s year end favorite list in December and I had it on my shelf. I don’t often read short stories, so how this one ended up in my library is a mystery, but I’m so glad that it did and even happier that JoAnn loved and recommended it. This may mean more short story collections in my future. 1.You Know When the Men Are Gone, a married woman who is awaiting the homecoming of her husband feels drawn to life of her neighbor and children. My least favorite. 2. Camp Liberty, probably my favorite, the story of a deployed soldier who has a hard time reconciling life back home with the one he is living in Iraq. 3. 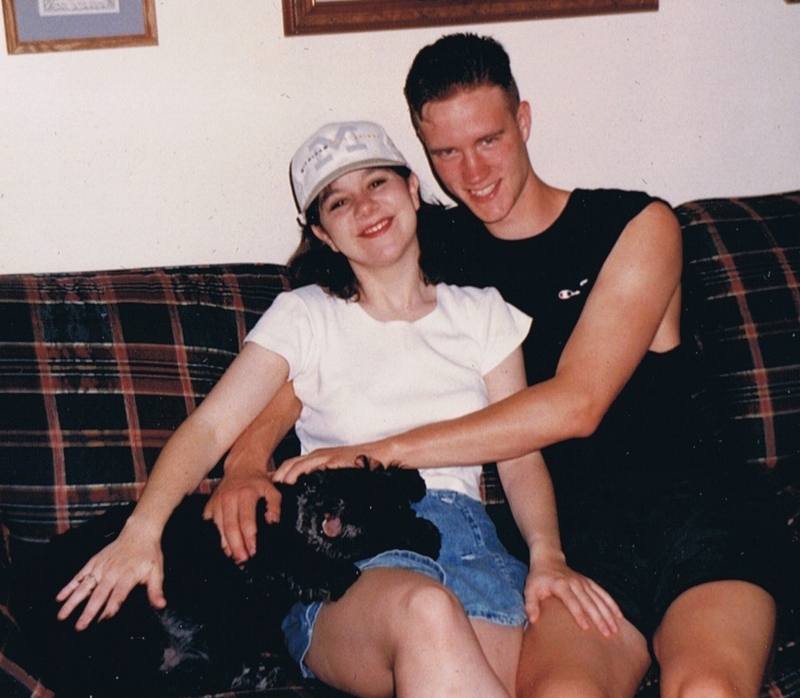 Remission, a mom’s two kids go missing on base. 4. Inside the Break, a wife discovers her husband’s infidelity while he’s deployed. 5. The Last Stand, this one is a heartbreaker. A soldier returns home after being wounded in Iraq and spending months recovering at Walter Reed. 6. Leave, creepy story of a soldier sneaking home on leave to see if his wife is cheating. 7. You Survived the War, Now Survive the Homecoming, a new mom dealing with her husband’s ager after returning home. 8. Gold Star, a widower’s life on base after her husband is killed. These stories are a gritty look, at the reality of what most of us will never have to face. Although I finished this book with a heavy heart I thought it was a book full if incredible insight. I gained a deeper appreciation for the sacrifices of the enlisted men and their families. Fallon speaks from experience and her concise writing engaged me. Surprsingly, I loved this one. List them from SHORTEST to TALLEST (I’ll help by listing the heights. I know, I know, this week is a guessfest!) Good Luck! Answers to last week’s Patrick Quiz here. Leaderboard here. 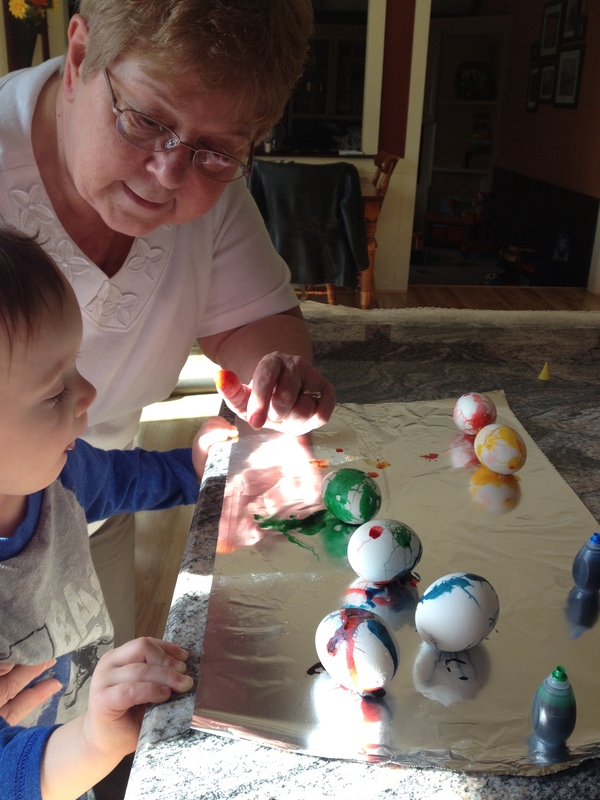 To participate in Saturday Snapshot: post a photo that you (or a friend or family member) have taken. Photos can be old or new, and be of any subject as long as they are clean and appropriate for all eyes to see. How much detail you give in the caption is entirely up to you. Please don’t post random photos that you find online. Visit At Home with Books to participate. 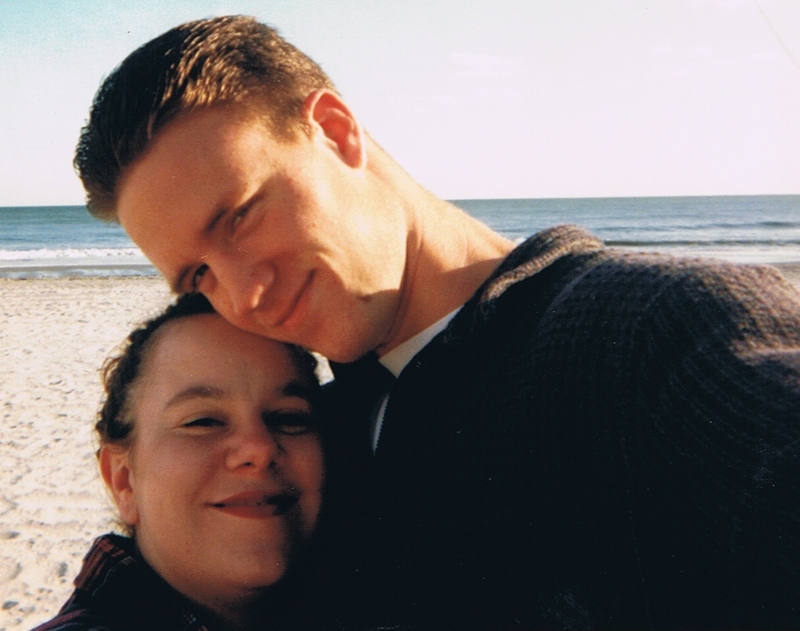 Yesterday was the 17th anniversary of our first date. On our first date Jason picked me up after I got home from work at 9:30 and took me to an improv comedy club and afterwards we went to a diner for some food. 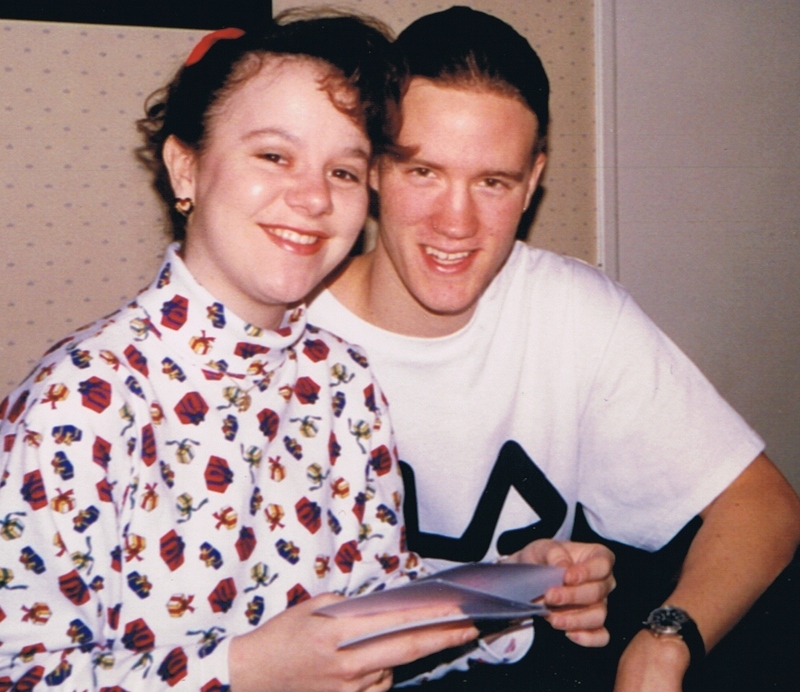 Tomorrow will be the 17th anniversary of our second date, a dinner after I got off work. In between those dates I had a date with some other guy, but the poor thing never had a chance after I met Jason. Here are a few pictures from that first year together. We look like such kids! 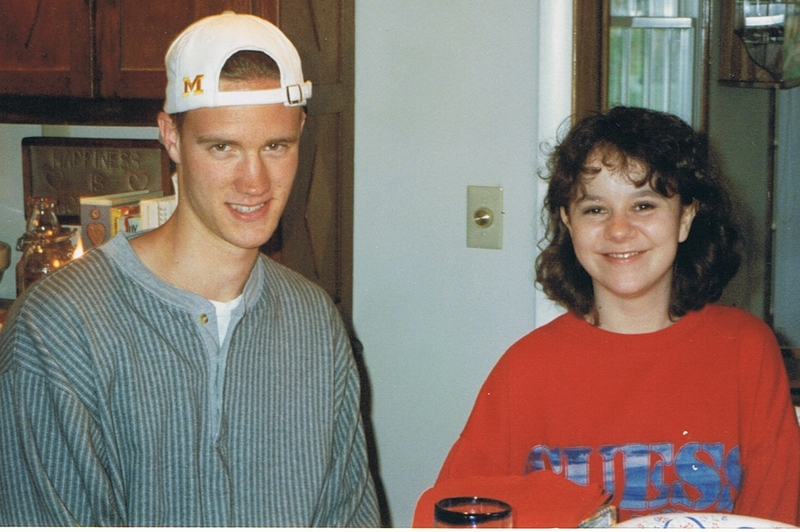 I was 24 and Jason was 19 and we were living in the Washington DC area. Megan, aka Cassie, has a past. One that involved showing off her lady parts for all the world to see at a club on Atlantic City’s boardwalk. But she manages to put that all behind her and get married, move to the burbs, pop out a few kids and enjoy life as a soccer mom. Only after 17 years she feels the draw of her old haunt and this action sets off a chain of events that put her and many others in danger. Detective Broome is working a disappearance, one that seems to connect many disappearances from the past. When Megan shows up it’s the break he had hoped for and needed, but it will not be enough to stop a murder or two. I thought this week we’d see if you can match these recognizable Patrick’s with something they said. Answers to last week’s Women History Quiz here. Rules and Leaderboard here.